My classes have wound up for the year (a little earlier than usual due to a crazy-busy November!). This is one of the sets of cards we made at my last Stamp-a-Stack. We used my favourite stamp set at the moment - First Frost. It's in the Holiday Catalogue. I think it's worth getting this one as a bundle, as the framelits are stunning too. While you're at it, grab some of the co-ordinating Frosted Floral DSP. The shimmer on this paper is absolutely gorgeous. I added some extra shimmer to these card by spritzing with alcohol mixed with Champagne Shimmer Paint. 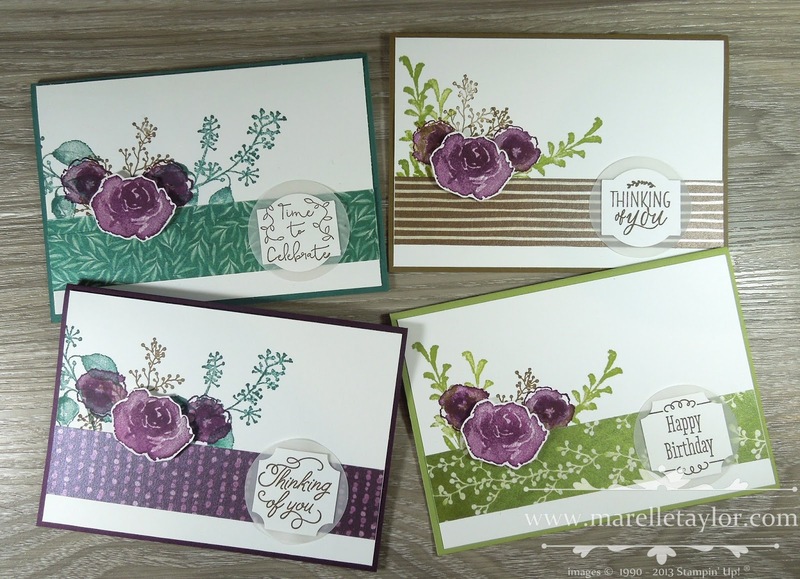 I've also used both of the Punch Box sets to punch my sentiments, and I've also used some extra sentiments from Treat Time - this stamp set is not designed to go with the punches, but they fit really well. I added a circle of vellum behind my sentiments for a little softness. These cards would work well for pretty much any occasion.